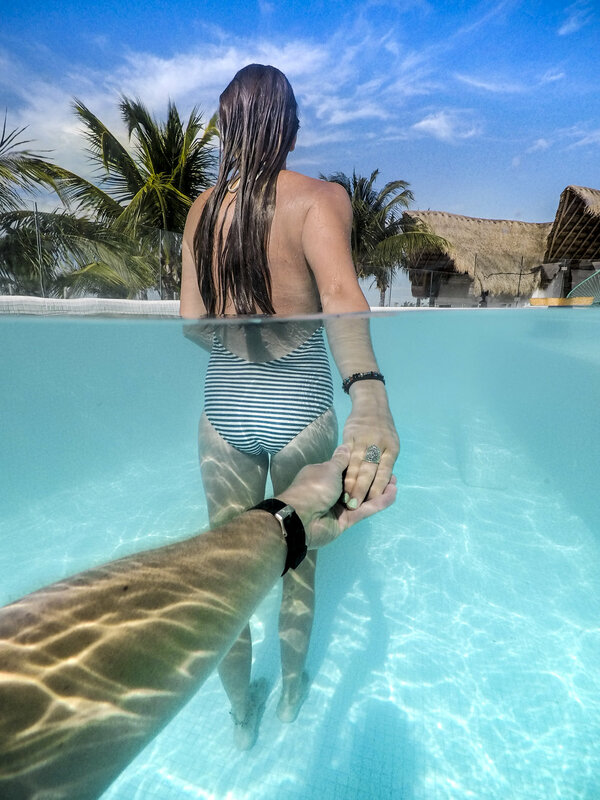 Our trip to Playa Del Carmen, Isla Holbox, Cozumel, Valladolid and Tulum. We were so excited about our upcoming trip Tulum. 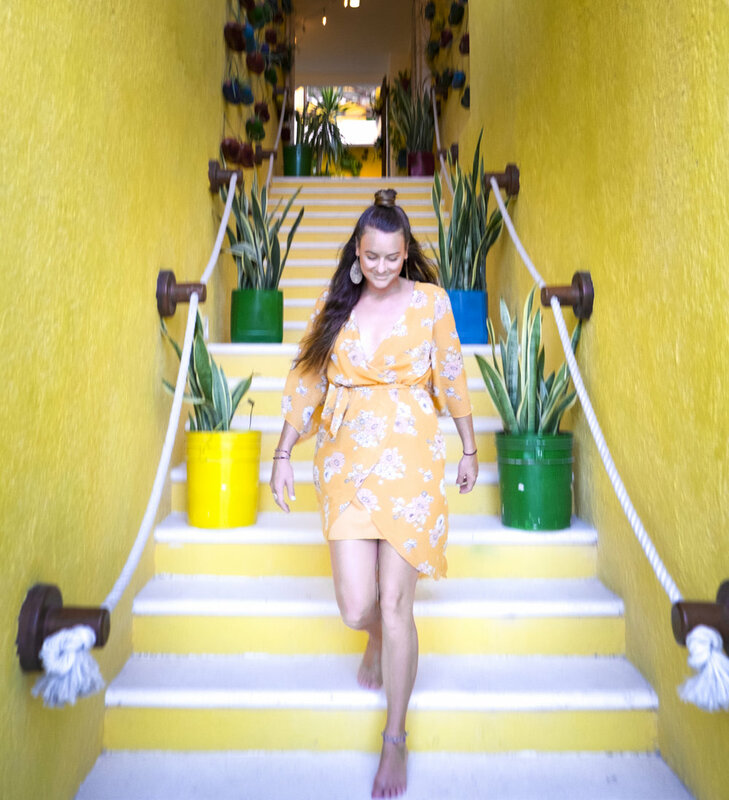 It’d been on our radar for awhile and we finally made it down to the Riviera Maya and had 5 days to explore this tropical paradise. 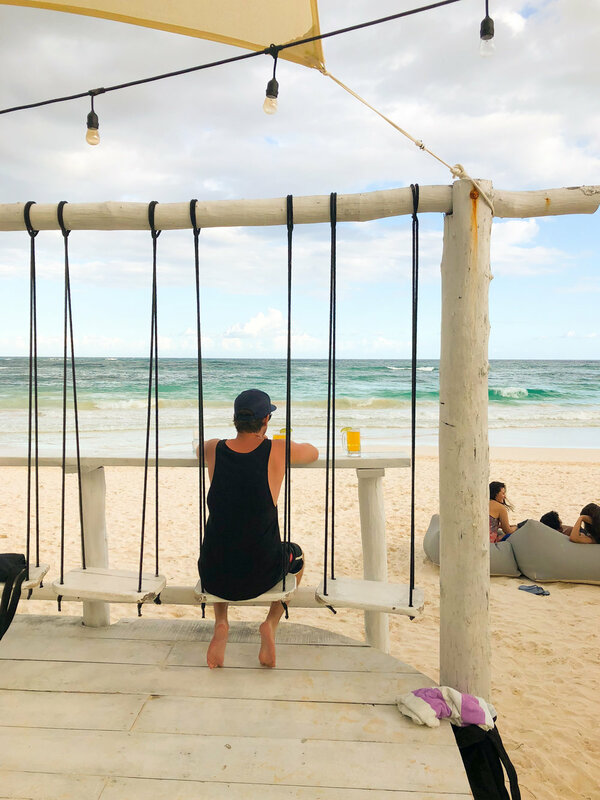 What started as a yoga retreat in the 70's, Tulum is complete with a perfect white sand beach, organic farm to table restaurants, swanky jungle bars, and bohemian shopping. 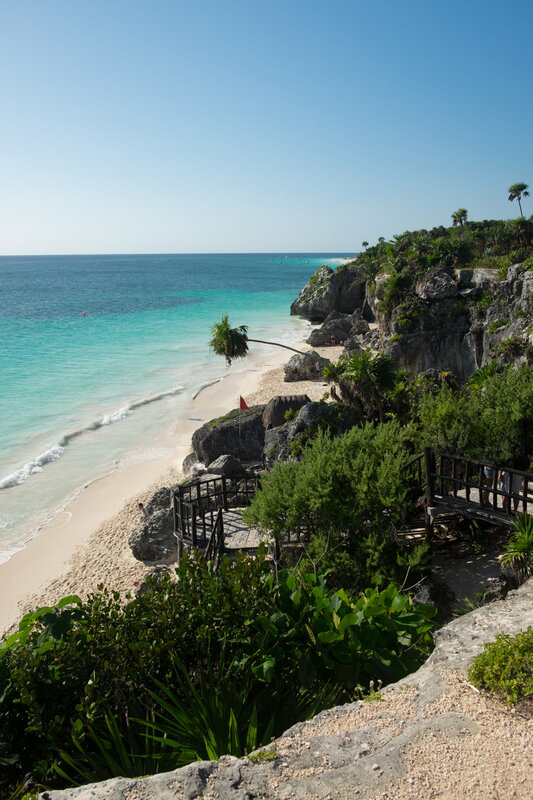 There are two sides to Tulum, the beachfront and the town. All of the best and expensive hotels are on the beach along with the pricier dining options. The small town of Tulum is a 15 minute bike ride away has cheaper lodging and more local style taquerias. We stayed at an AirBnB in the town for $30 a night which include bikes and was in quiet neighborhood called Villas Tulum. We rode our bikes down to the beach everyday but enjoyed the more local feel of staying in the town. Tulum is becoming more popular lately for good reason. People come from all over the Riviera Maya to visit the gorgeous Mayan Ruins of Tulum. Situated on the cliffs over looking the turquoise and blue water we were in awe of these ancient buildings. It is incredible to think that the Mayan Civilization picked this spot as a location for one of their cities. TIP: Make sure to pack a swimsuit when visiting these ruins. Swimming is allowed at the beach (pictured below) and you will definitely want to take a dip after viewing the ruins in the heat. It was surreal swimming in the water with the ruins towering above you on the cliffs. This beach was also one of the cleanest and had the clearest water of any beach we visited this trip. Go early! We were here and had this entire beach nearly to ourselves, by 11 AM the beach was full! Riding your bike will provide the fastest way in and out! When visiting the Riviera Maya you have to swim in a cenote. These natural fresh water pools are unique to the area and are scattered throughout the surrounding jungle. Rent a driver for the day to find some off the beaten path. We visited Cenote Samula and Xkeken on our way to the city of Valladoid and because we werer there early we were the only people inside the cave. Swimming in these cenotes was one of the coolest experiences we ever had. We had the place entirely to ourselves with only the bats for company. 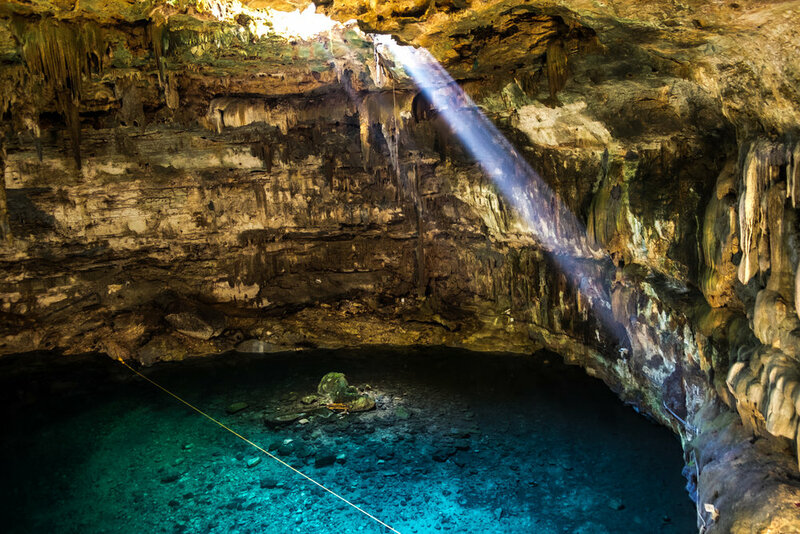 TIP: At 10:30am in Cenote Samula this magnificent ray of light beams down into the pool and creates a dramatic effect. 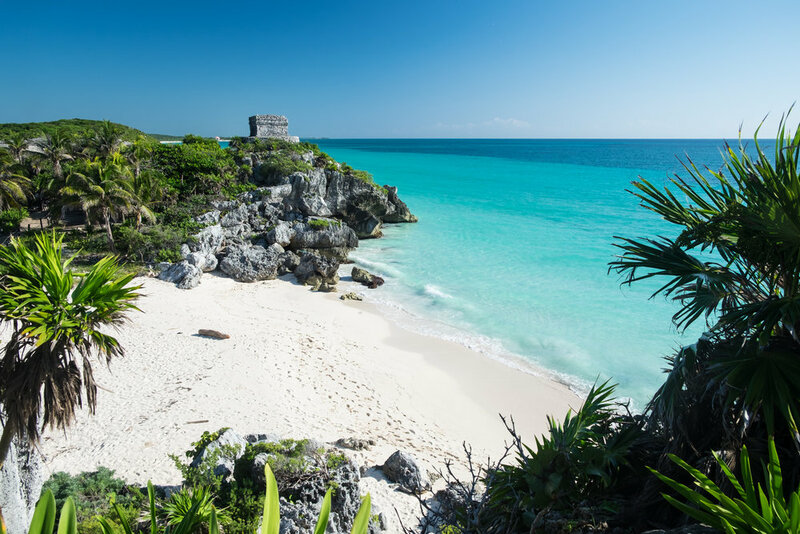 One of the most picturesque beaches in the world Tulum beach is what keeps visitors coming here time and time again. You couldn't ask for a more beautiful beach. Lined with chic hotels and bars you could spend days walking along the beach popping into fun little spots to eat and drink the day away. Spend the afternoon moseying along the winding streets amongst and the sherbet-colored buildings. Stop at a local restaurant to indulge in traditional Mexican fare. We ate at the restaurant in the courtyard of Hotel El Mesón del Marqués and had a fantastic meal. The tortillas were made right in front of you and the menu included a lot of local dishes. We are still drolling over the Yucatan lime soup we had here. One of our favorite things about Mexico is Tequila and Mezcal! 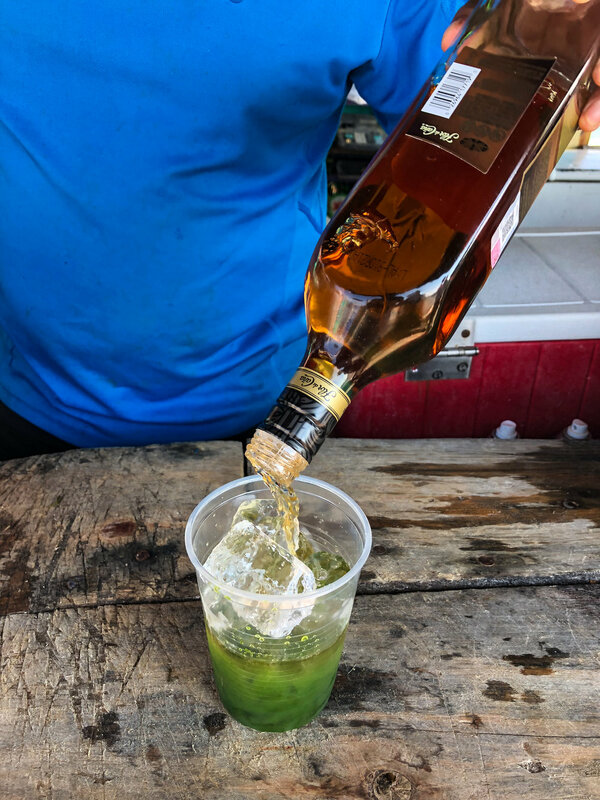 We were lucky to have the opportunity to visit a tequila distillery on our way back to Tulum from Valladolid, We got a tour through the blue agave field and sampled different aged tequilas. While this is a small distillery it will give you some insight into the tequila making process. If you are looking for a real tequila focused trip you will need to head to the region of Jalisco. After eating only Mexican food for two weeks Posada Margarita's homemade Italian pasta was just what we needed. We came here for lunch and ended up spending the entire day lounging on their beach chairs. The funky bohemian vibe at this restaurant/hotel was welcoming and relaxing. We never wanted to leave! We loved the fresh made forccaia which was a free appetizer with every meal. (Pictured above) We also fell in love with these unquie beach huts in front of the restaurant (Pictured below). If you're lucky you can hang out in one of these for the day after your meal free of charge. 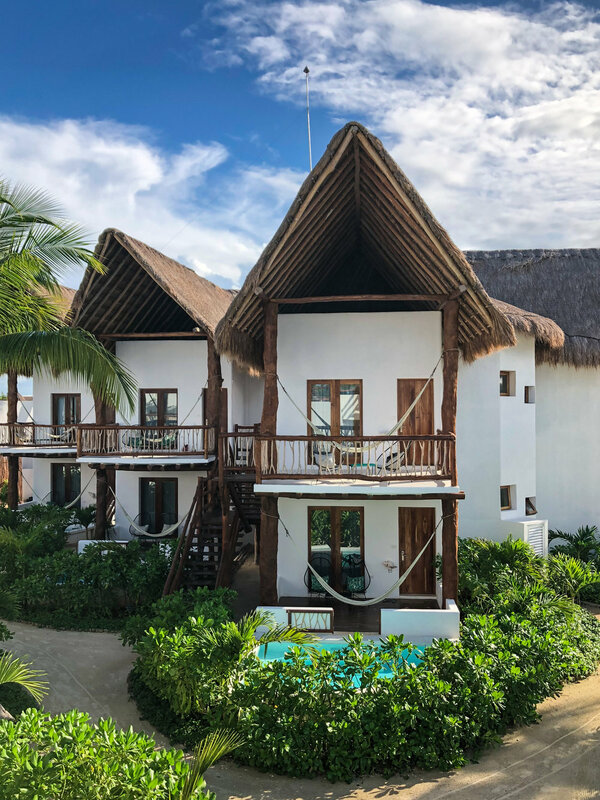 We loved Posada Margherita and want to stay in one of their few beachfront rooms next time we come to Tulum. Great food, awesome ambiance and a beachfront location! What else do you need? Looking for a good time and some great tacos? 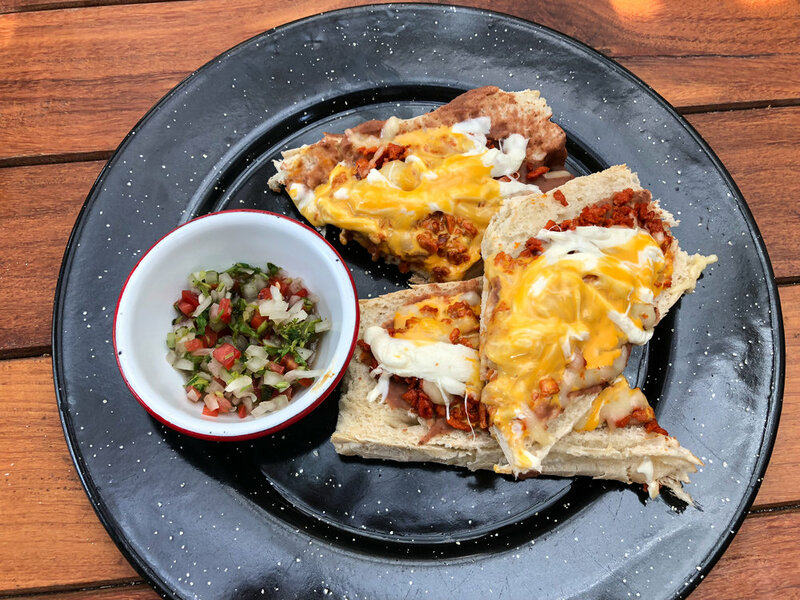 Tacos Eufemia is one of the most happening spots on the beach. With cheap tacos and even cheaper beer this place is always packed. It's a fun place for a day party. Expect to leave with a full belly, sunburt nose and with lots of new friends. 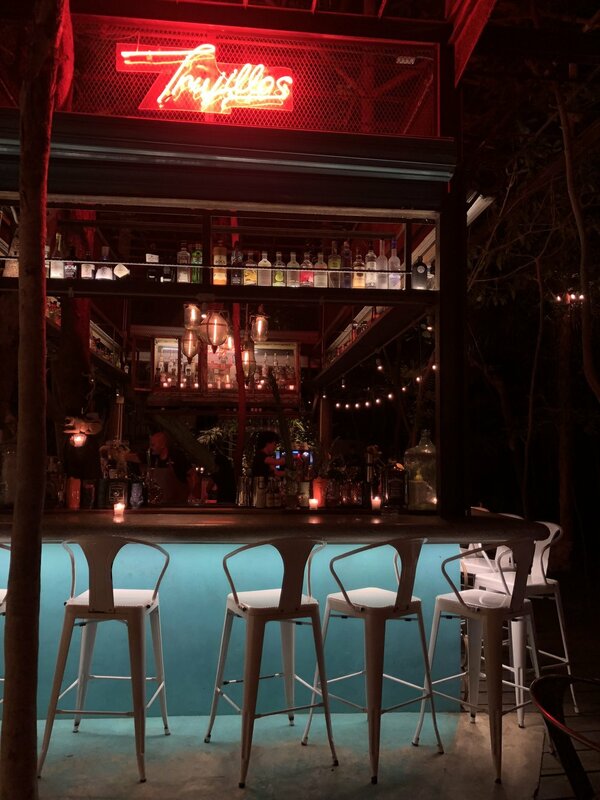 The most talked about restaurant in Tulum is undoubtedly Hartwood. All the food is sourced from local farms and is soley cooked over an open fire. People line up for hours to snag a table at this famous hot spot. For us, after all the hype the food fell a little flat but we still enjoyed our evening and watching the Chef cook over the hot coals right in front of us was a great experience. 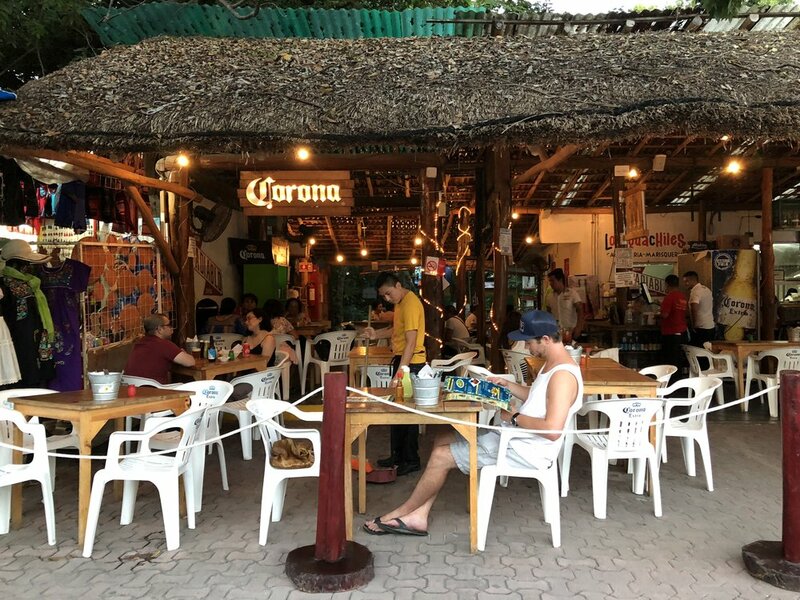 Head into Tulum town and search out this open air taqueria. You will know you've arrived when you see the giant al pastors roasting on spits. This no-frills taqueria is a local favorite and for good reason. The food here is insanely delicious and incredibly cheap. It's worth the journey into town to eat dinner at Antojitos, this place is perfect. This cute cafe nestled in the jungle has a completely healthy and vegan menu. Grab a hammock and enjoy an homemade yogurt bowl with fresh local fruit while sipping on a cocconut milk coffee. Another Tulum hot-spot Casa Jaguar has an incredible ambiance. Set back in the jungle the vibe here is swanky and the food and drinks are divine. We came here for one thing, churros dipped in chocolate, but we would also reccomend coming here for dinner. In Tulum there are so many amazing restaurants there is no way you could eat at them all. Looks like we will just have to plan another trip back soon. This super unique restaurant and bar can be found along the main beach drag. Keep an eye out for the silver airstream trailer tucked in along the palms. This kitchen on wheels serves up tasty tacos! Sit at the bar and check out the funky palm tree wall paper while the bartender mixes you up a delicious tropical cocktail. Famous for its chic white bar swings overlooking the ocean, CoCo’s is definitely posh but the setting is rad. Expect to pay $12+ for a drink but it’s worth it to kick up for feet for awhile on one of their adorable white swings. Ziggy’s cocktails were some of our favorite in Tulum. 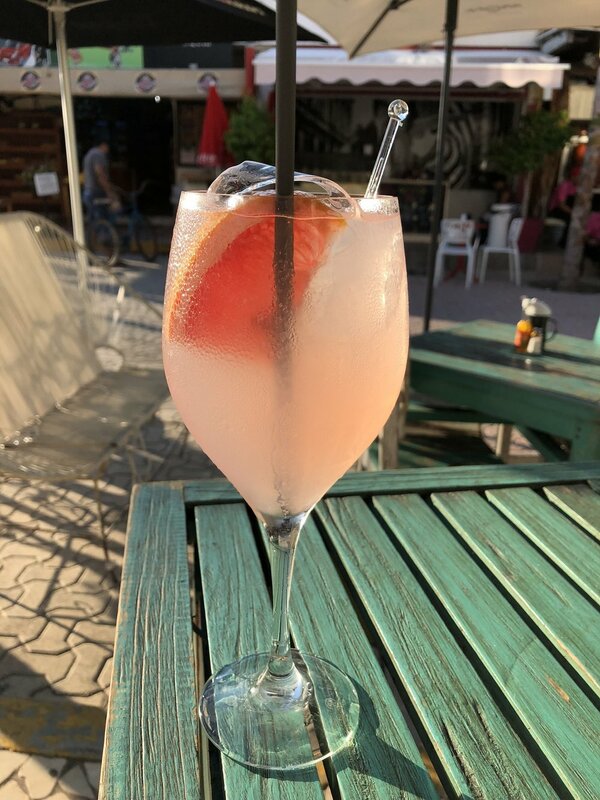 Like most of the beachfront bars the drinks are a little pricy but the bohemian design and cool vibe will make you never want to leave. 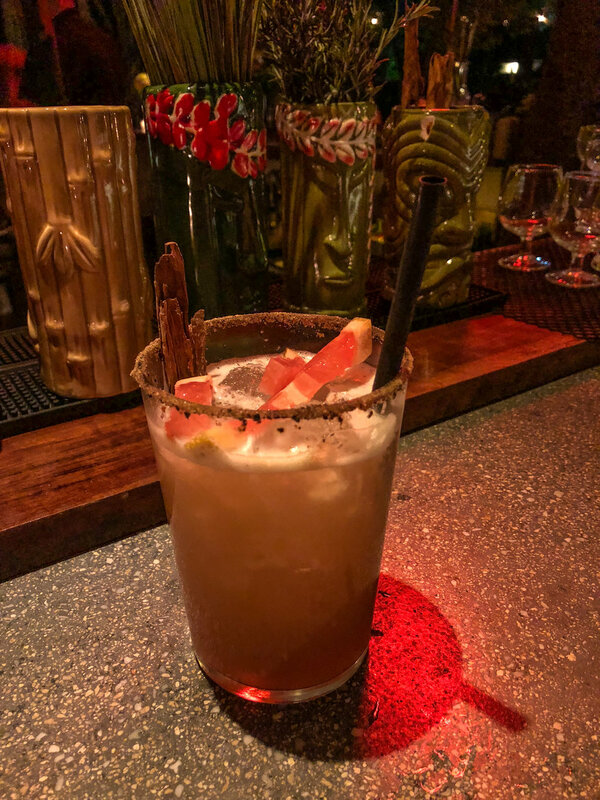 TIP: Try some of their incredibly unique mezcal cocktails! Look for the shine of the neon pink sign out front and mosey your way into this jungle bar. Craft cocktails and tapas are the name of the game here. 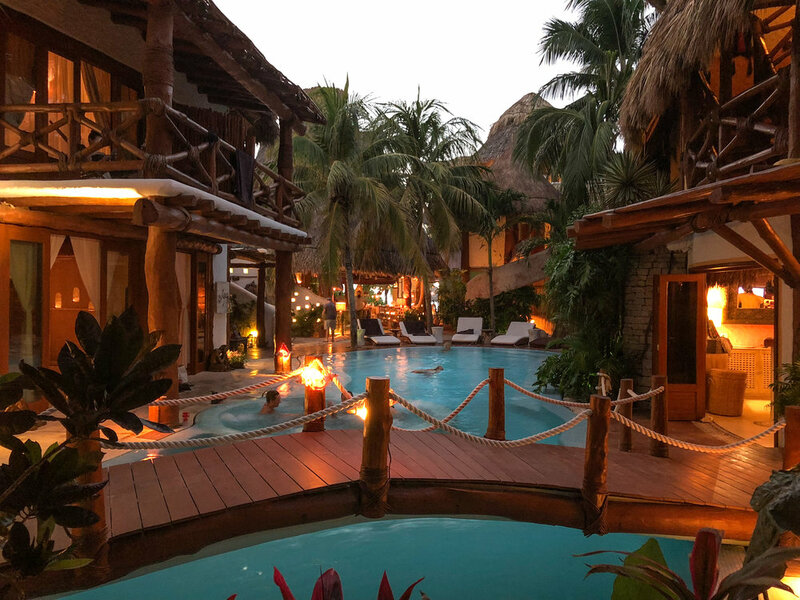 Come for a pre-dinner sipper or stay and dance the night away under the disco ball to the sounds of live music at one of Tulum’s most hip bars. 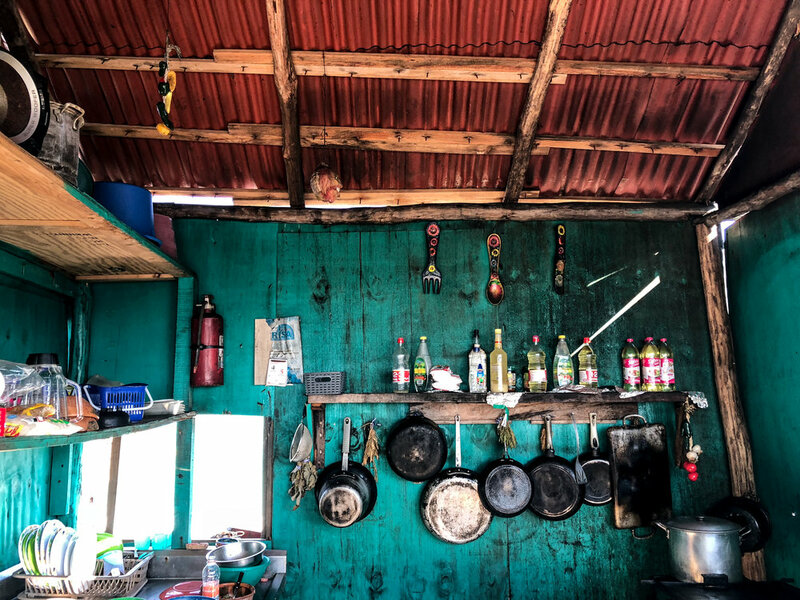 One of the most lively bars in Tulum town, Batey’s Mojito and Guarapo Bar shouldn’t be missed. They are known for their can sugar mojitos which are made with freshly pressed cane sugar! You can see their sugar cane press built into this old VW bug. You can watch as they crush the sugar stalks emitting this delicious sweet sugar which is used in all the mojitos. Each drink is garnished with a raw cane sugar stalk. Make sure to chew on your stalk to taste the pure sugar. Delicious! When we were here you could hear this beautiful jazz music from a block away, as we followed the tunes we entered into this place and saw a 20 piece band setting the perfect tone for a fun night out. We stumbled across this bar one night in the town while we were shopping. The cool hanging Edison bulbs and chic interior design drew us in. We came back every night, chatted with the nice bartenders and enjoyed the rad music. TIP: Come by after midnight, when the real party begins as a nightly DJ takes the stage. 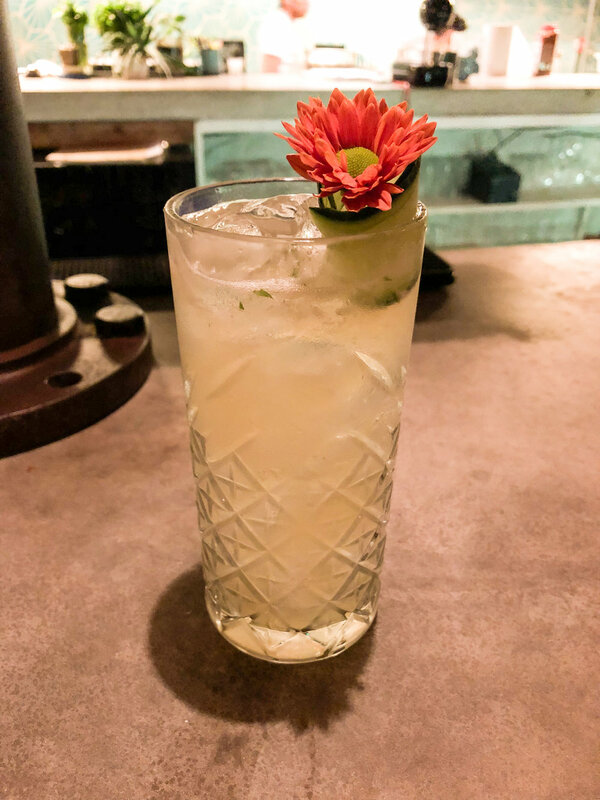 We had to add Posada Margherita to our favorite bar list as well as our restaurant list because these cocktails we just that good. Everything from the rustic wooden menu boards to the fresh unique ingredients blew us away. We loved this spot. 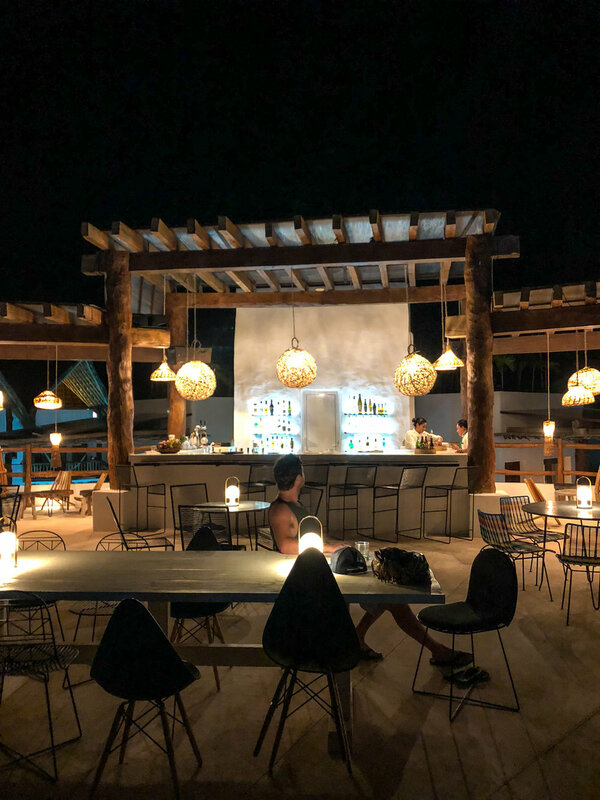 If you could only go to one restaurant/bar in Tulum this should be it! 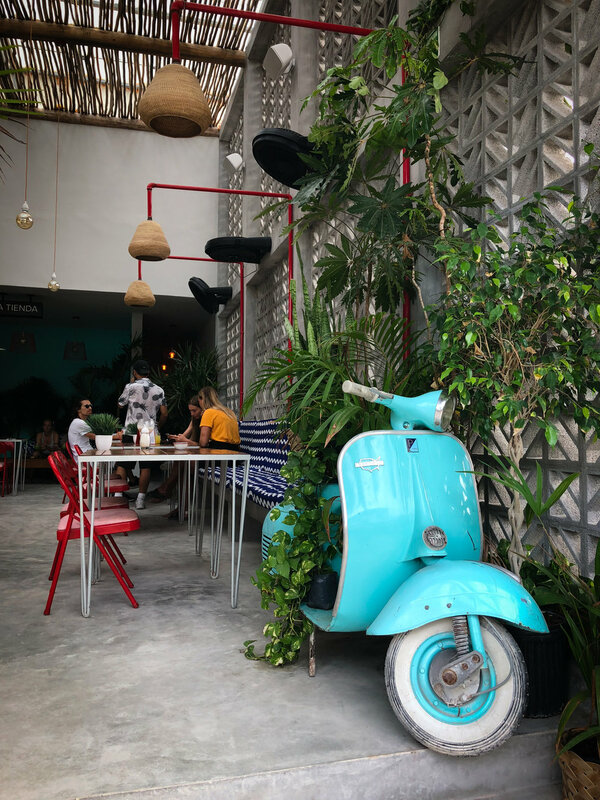 We hope you find yourself in Tulum and have the chance to check out some of these amazing restaurants. If you do make sure to leave us a comment and us know what you think! This small island north of the Yucatan Peninsula is a laid back paradise. The whole island is car-free with the main mode of transportation being bikes and the occasional golf cart. We spent 4 days living the good life on this sleepy little island. One of the best things we did was rent a golf cart for the day. The island is only 25 miles long and 1 mile wide. Our golf cart was a beast with giant wheels and because it rained the night before we spent the day splashing through mud from one side of the island to the next. We spent an entire day relaxing under our own private beachfront palapa in Casa Sandra Boutique Hotel. This place was beautiful and the beach bar was just steps from the water. 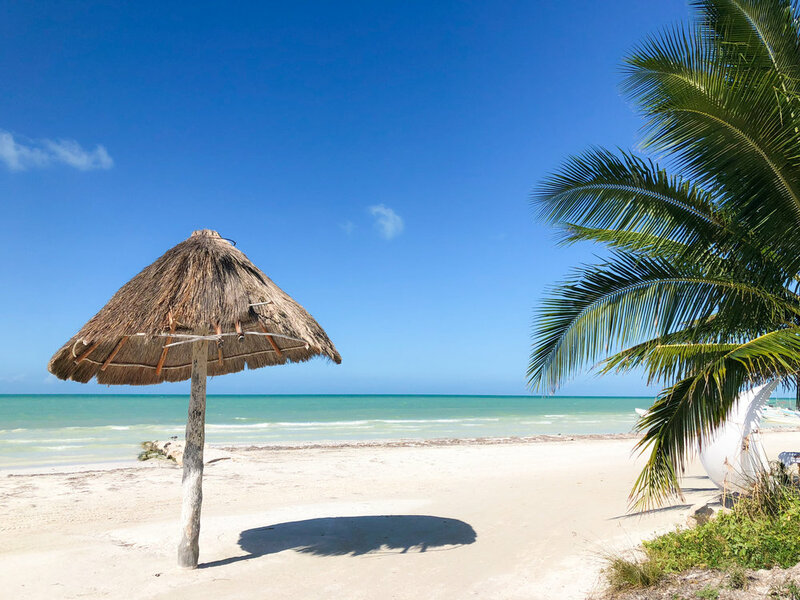 If you are in Holbox walk along the beach until you find the perfect spot and just pay a few bucks to lounge for the day. 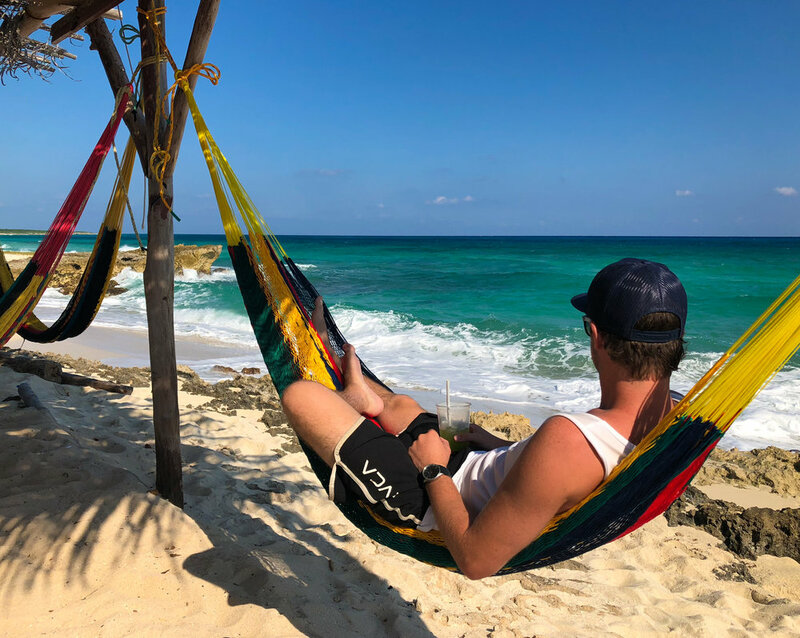 The iconic Holbox ocean hammocks! If you're coming here you have to find these and spend some time swinging over the water. We aren't going to tell you where these are. Holbox is small and it was fun searching and discovering these for ourselves. The whole island of Holbox is only made up of a few streets. 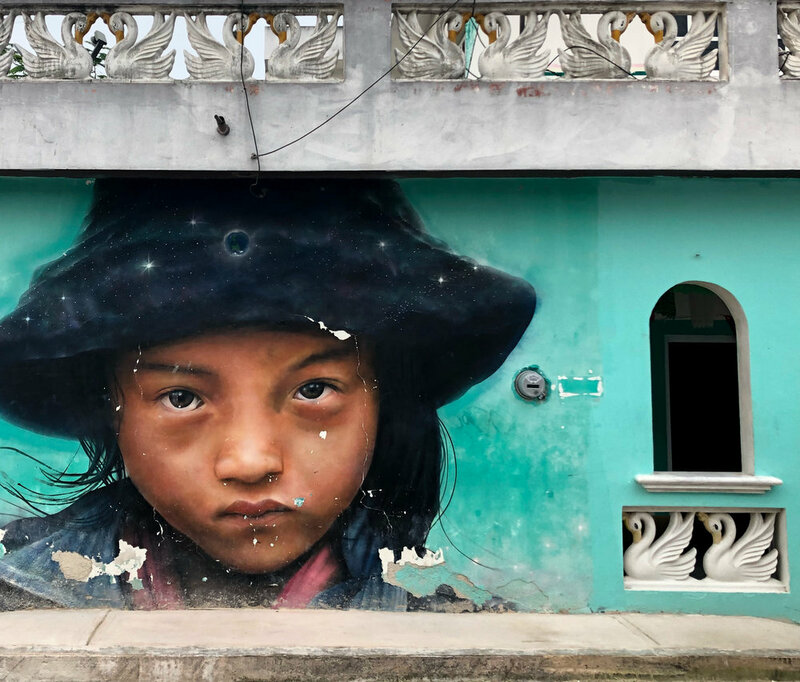 By the end of our 4 day stay we had a pretty good idea where everything was but we loved roaming the streets and looking at the eclectic and skillfully done street art. Brightly colored buildings line the streets. 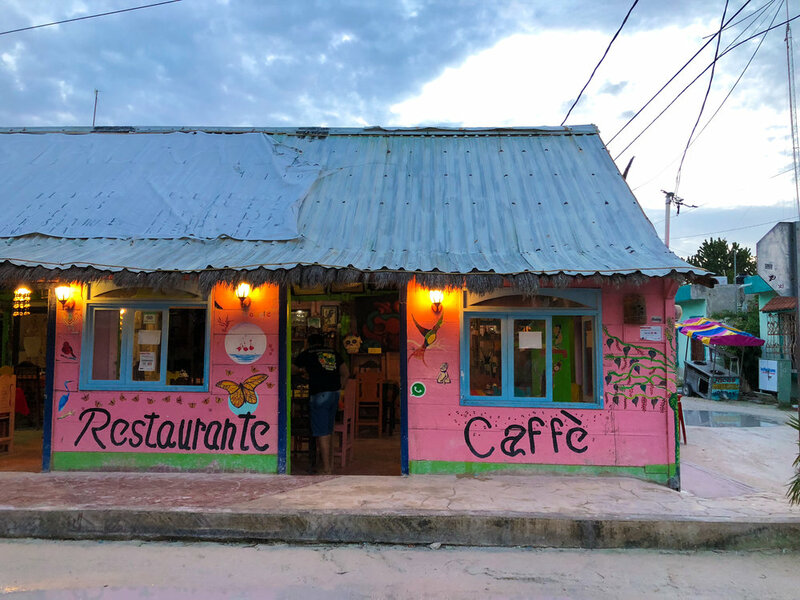 Our favorite restaurant in Holbox. We ended up eating here for breakfast and for dinner. We loved the funky open air design of this place and the food was always fresh and delicious. If you're looking for a romantic ocean front meal make sure to check out to Mandrina's beach club. Along the main beach and part of Casa Las Tortugas Hotel this place is easy to find. We had an amazing meal here and probably had the best spot in the house for enjoying the most beautiful sunset. One of the most magnificent sunsets we saw on this trip! Check out those colors. 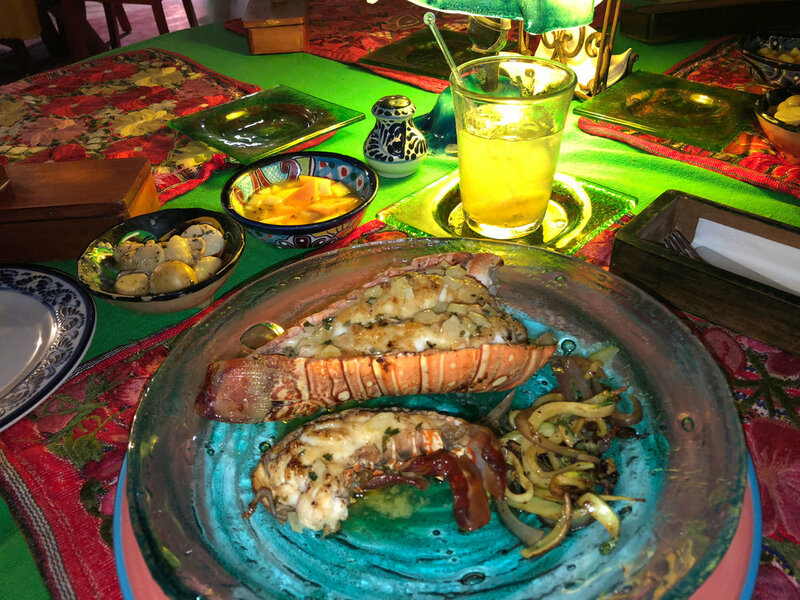 One of the most special restaurants on the island El Chapulin, is all about fresh and local ingredients. Instead of a menu the chef comes directly to each table and describes the nightly dishes which are all based on the catch of the day and what ingredients are in season. Luckily for us the local fisherman pulled in some lobsters earlier that day. For a cheap and quick bite to eat head to the daily market on main street which sells local produce and also delicious tacos, tortas and more. Each night and sometimes during the day, the local street carts sell a variety of different on the go food for cheap. 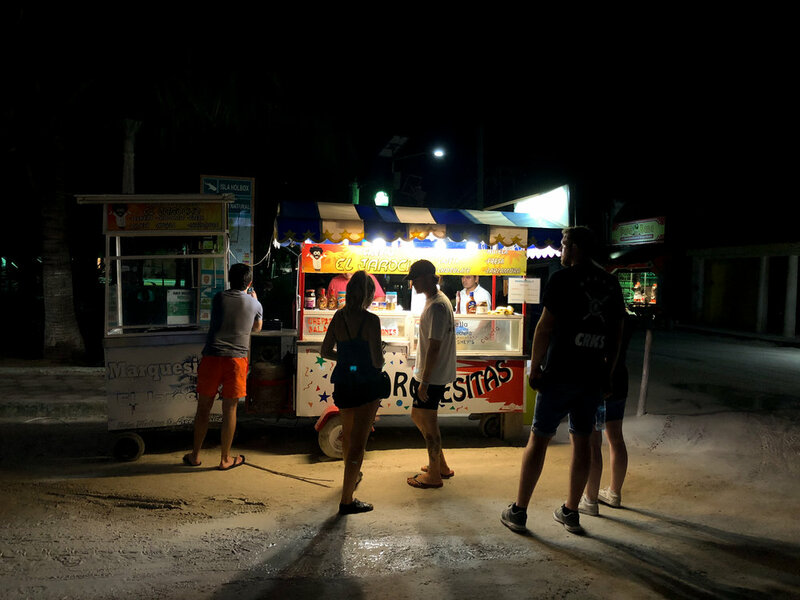 Whether you're looking for late night tacos or an ice cold coconut on the beach these little carts are always a great idea for a quick bite. TIP: Try a marquesita from one of the nightly food stalls. These delicious crepe style desserts are unique to the Yucatan region and are a great late night snack. You can find them at one of the food carts near the main square. This tiny beach shack has the best location on the island to catch an epic sunset. With only a few swings at the bar this place is small but you can grab your drink and find a place on the sand to watch the sun set. 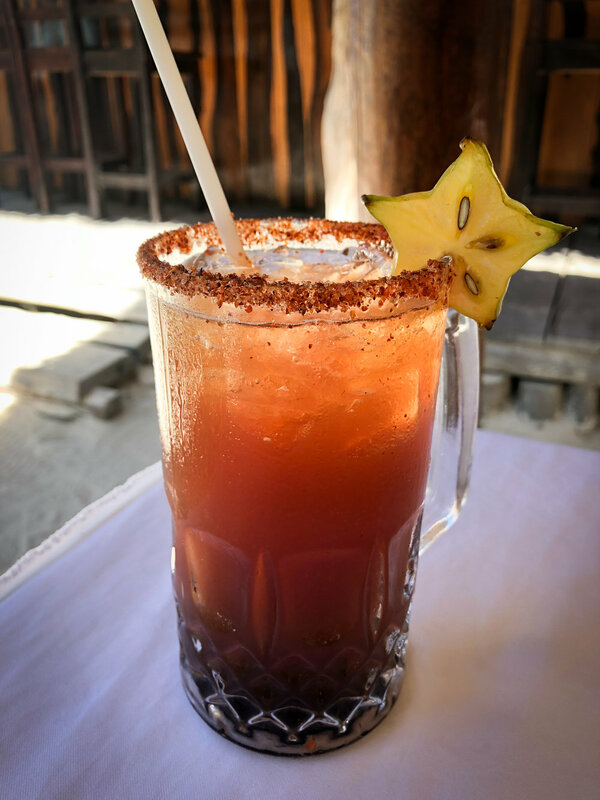 TIP: Are you a fan of micheladas? They are our favorite!! And most restaurants in Mexico serve them. When ordering make sure to get a "Ojo Rojo" that is what they call these deliciously salty red beers. Yum. A craft cocktail bar and restaurant tucked into the jungle. This place is a hidden gem. The cocktails were intricate and didn't disappoint. We meant to come back here to try out the food but didn't get a chance. Definitely on our list for our next visit. You don't have to be a guest at Palapas Del Mar to enjoy the Sky Ball and pool located on the roof of their beachfront hotel. We spent an entire day at this chic rooftop bar, sipping cocktails, reading and taking dips in the infinity pool. 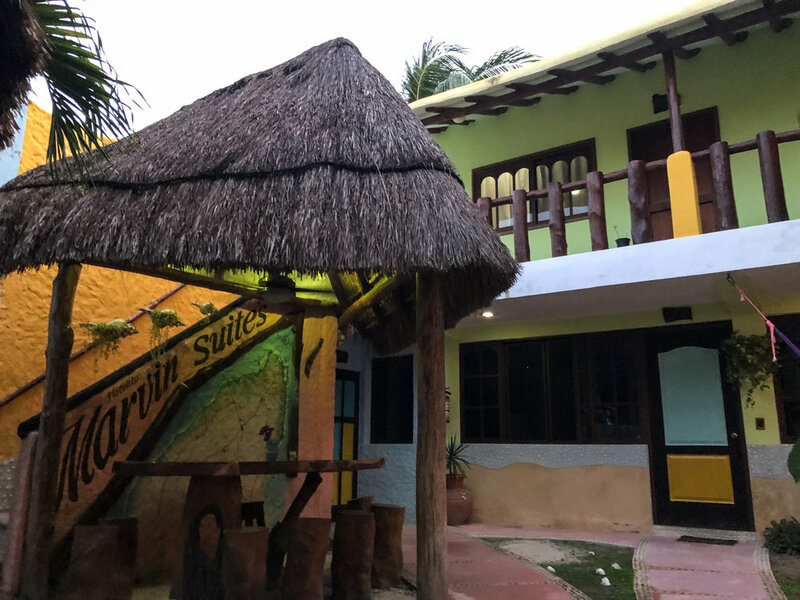 We stayed at the Marvin Suites during our stay in Holbox and couldn't have been happier. Most of the beachfront hotels charge almost double what we paid to stay here. Although it wasn't on the beach, it was right downtown and had AC. We would definitely recommend Marvin Suites, our room was giant and very clean. With the island being so small staying in the town was nice and taking the two minute walk to the beach. 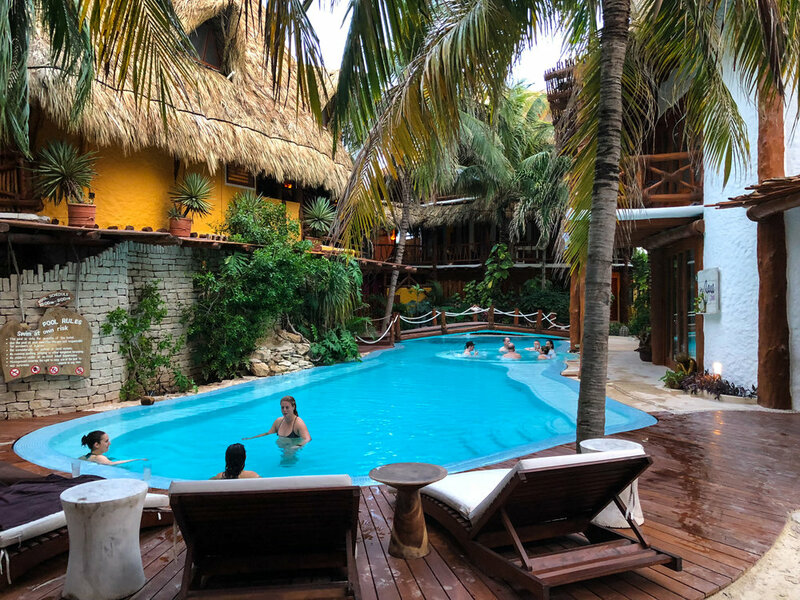 Our choice for a luxury hotel in Holbox. We would love to stay here next time we come here. We loved the tiny designer bungalows at this hotel, each with their own pool. The top floor has the rad Sky Bar with the infinity pool and below was a Sushi Bar next to the hotel pool. This place was a dream. 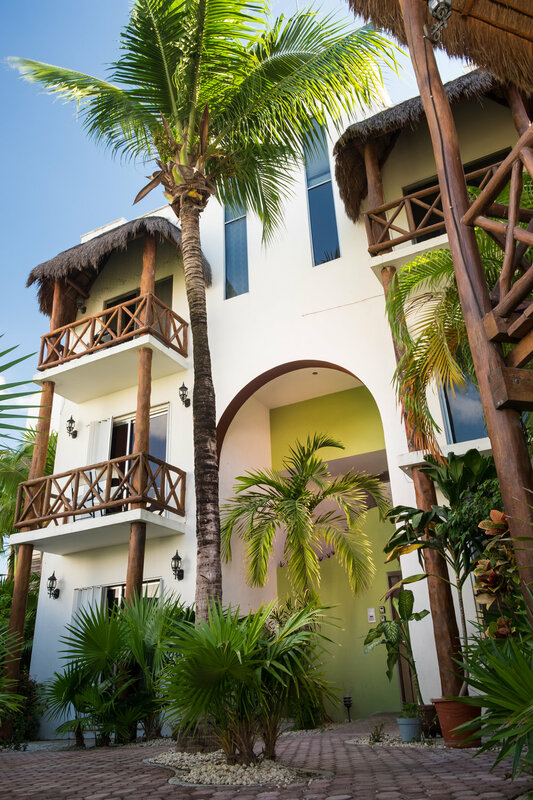 Another badass property on the beach; Casa Las Tortugas has it all. A lagoon style pool, beachfront restaurant and a cool beach lounge area. 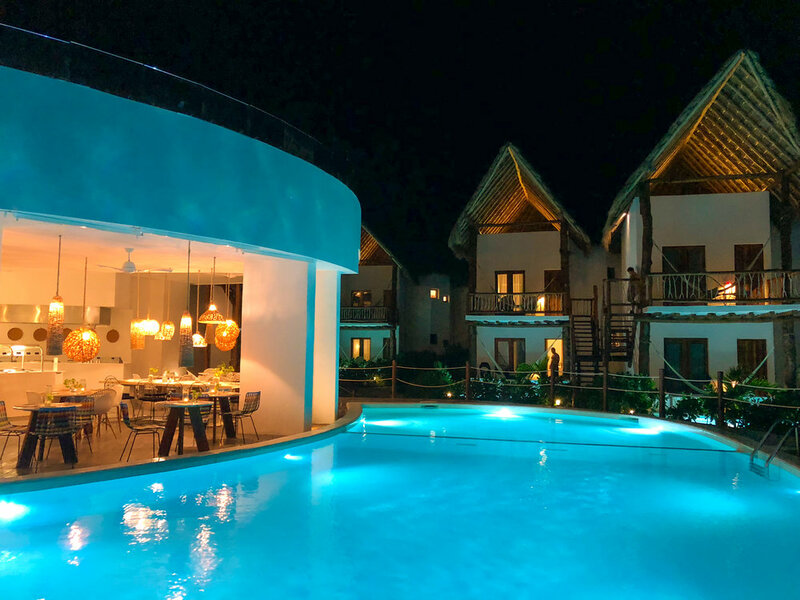 This would have to be our other top pick for places to stay in Holbox. 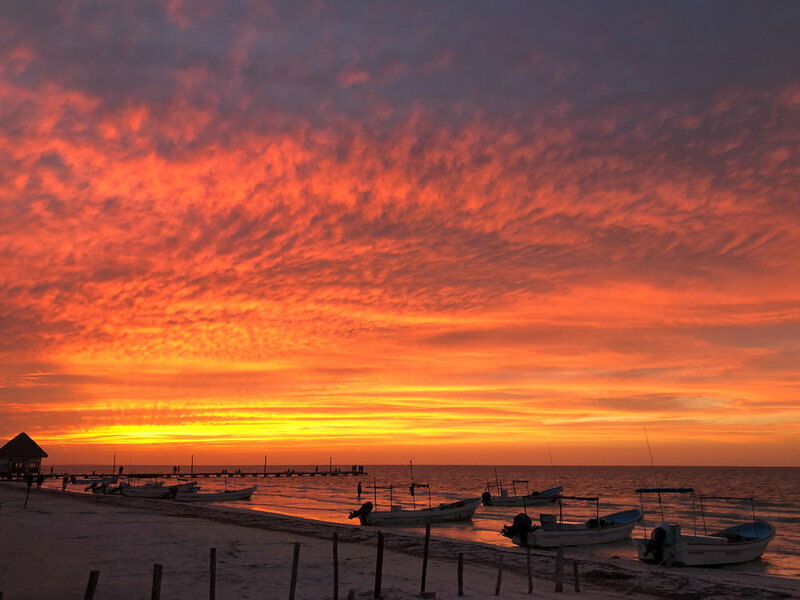 We hope that you find yourself in on this paradise island one day and that this guide helps you find some of the best things Holbox has to offer. The best way to explore Cozumel is on the back of a scooter. We rented one for the day for $25, hopped on and took off. There is one main road around that goes around the island so it's basically impossible to get lost. Our first stop was at Playa Palancar. This beach was picture perfect and had a funky little beach bar and restaurant. Keep an eye out for the baby raccoons running around. After a quick swim in the ocean we took off again and headed to the Eastern side of the island where there are less people and more seculuded beached. The glory of having your own moped is the ability to stop anywhere you would like. As we were cruising along the coast a small tiny shack with the word "Mojitos" on it caught our eye. We flipped a quick U-turn and arrived at one of the coolest little bars we've ever been to. We are still dreaming about the mojito we had at this little bar. 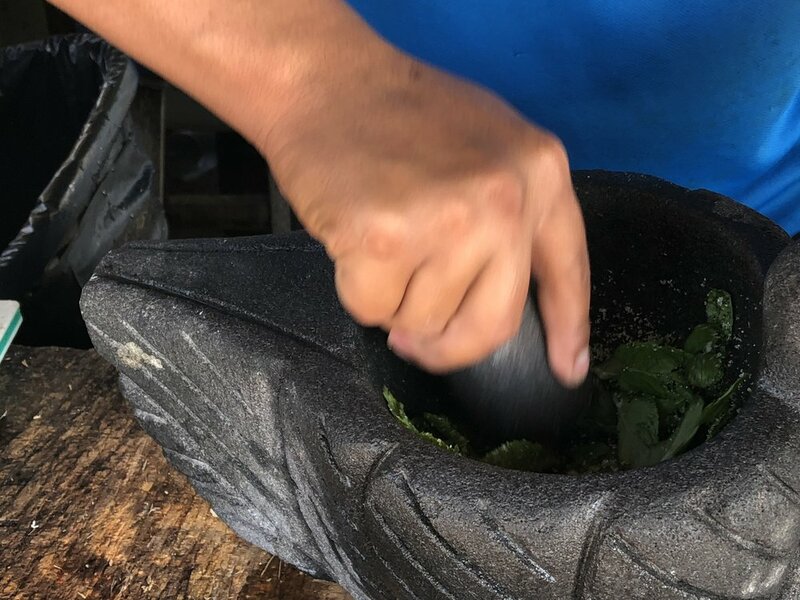 It was made with tons of fresh mint and grinded into a paste with a pestle and mortar. Unlike your usual mojito where you muddle mint then have leaves floating around inside your drink, this mojito was super smooth and a bright green color. Once you get your mojito go relax in one of the many hammocks on the beach behind the bar. Next we heading along down the coast and stopped at Coconuts for lunch. This lively restaurant and bar is right on the cliffs. After a full day exploring the island we headed back on the ferry to Playa Del Carmen. Cozumel was a fun day trip and there was no better way to see it than on the back of a moped. Our first stop in the Riviera Maya was the lively beachtown of Playa Del Carmen. We heard about it's amazing food and thriving craft cocktail scene and couldn't wait to visit. The main street in Playa is Quinta Avenida (5th Ave). It is the main street in the downtown area and is lined with beautifully designed restaurants and bars. It runs parallel to the beach only a few blocks up. We found an AirBnB close to the beach that was at the end of 5th Avenue and we were easily able to walk around and explore. It was only $55 a night for a one bedroom apartment with a kitchen, AC, fast wifi, and a pool. What else do you need? We spent three days lounging on the beach and getting a feel for the area. 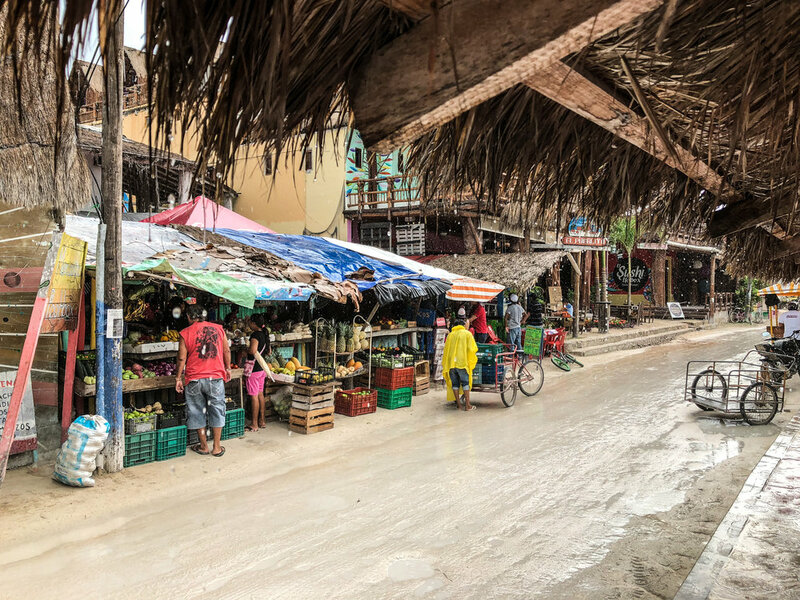 Expats from around the world end up settling in Playa because of its perfect climate, affordable prices, and a semi-westernized feel. If you want a real deal Mexico experience, Playa Del Carmen isn't the place to go. If you want a mellow intro to Mexico with plenty of great restaurants, bars, and beaches this is a great first stop. The beaches in Playa del Carmen are beautiful and are completely public. You can walk along the entire beach from one end to the other. Bring your own blanket and cooler for the day and claim your own spot in the sand; or pay to use a chair and umbrella at a beach bar. Either way make sure you log some beach time. It seemed that the further south we went the nicer the beaches got! When visiting the Riviera Maya you cannot miss a visit to one of the fresh water cenotes found here in the Yucatan. There are many different types of cenotes; some are inside caves while others look like tiny jungle lakes. The usual entry fee it only between $5-$10. The water in the cenotes is fresh and crystal clear. There are several different species of fresh water fish who live in the cenotes so make sure to bring your snorkel and mask. We visited the Garden of Eden cenote which was only a short 20 minute taxi drive from Playa Del Carmen. 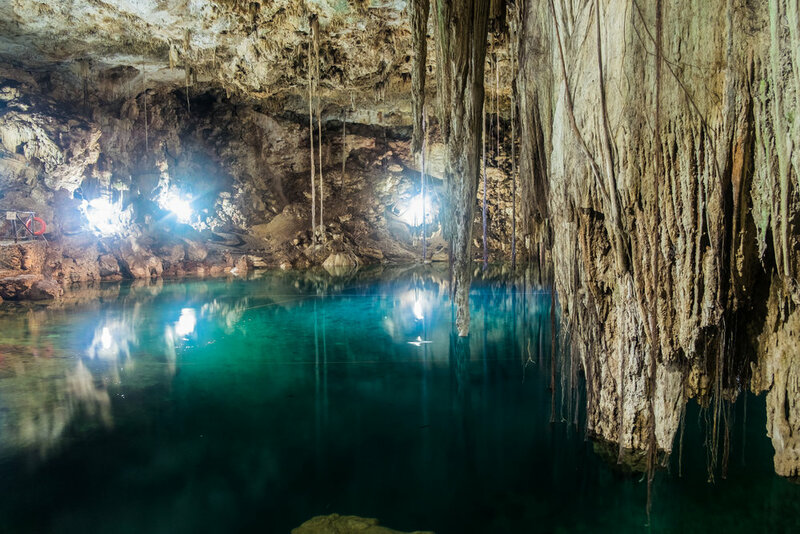 TIP: To keep the water in the cenotes clean and clear they prohibit the use of sunscreen and bug spray with deet. Because of this some of the stores in town sell deet-free bug spray. 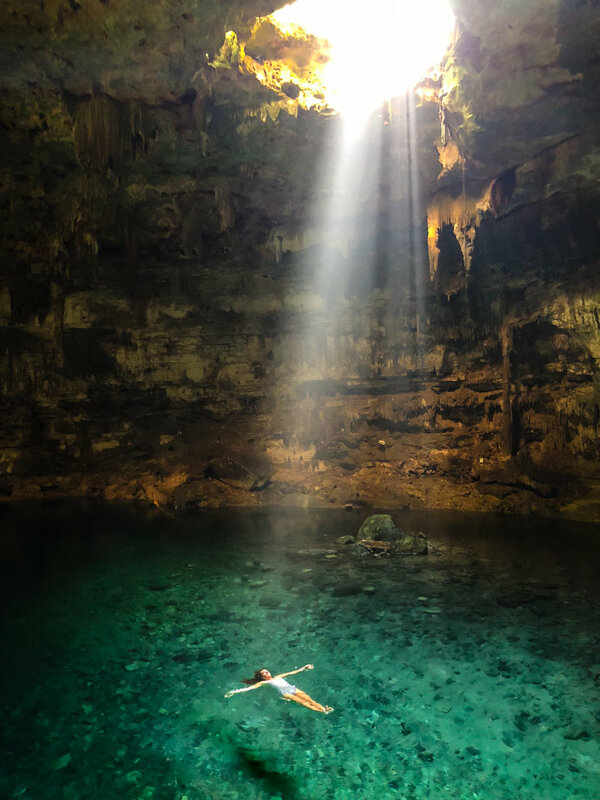 Remeber to grab a bottle before you visit one of the cenotes. For a fun day excursion hop on the ferry and go to the tiny nearby island Cozumel. These ferries run every hour and only take 45 minutes. When we visited Cozumel we rented a moped and explore the island. There is only one road that goes around the island and there is very little traffic which is perfect for a moped. Where the ferry drops you off is the touristy side of the island, get out of there as fast as possible! The other side of the island offers perfect beaches and beautiful turquoise water. We had a blast cruising around the island and hitting different beaches and bars along the way! 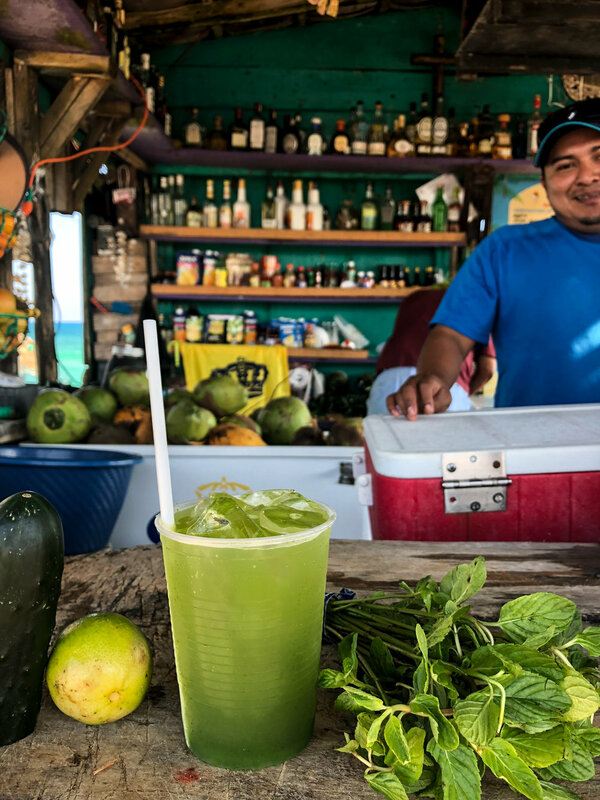 TIP: When in Cozumel head to the east side of the island and look for this tiny mojito bar. The mojitos served here are made with a pestle and mortar and were the best we've ever had! We are still dreaming of this delicious green cocktail. Our favorite restaurant in Mexico! No trip to Playa del Carmen would be complete without at least one meal at one of El Fogon's two locations. This casual taqueria is always packed because the food is insanely good and cheap. With a completely open kitchen you will see a huge al pastor spinning on a spit and two chefs cooking up all the food on a flat top grill. The al pastor here is the holy grail of taco meat, find it, eat it, repeat. A great little restaurant between 5th Ave and the beach. 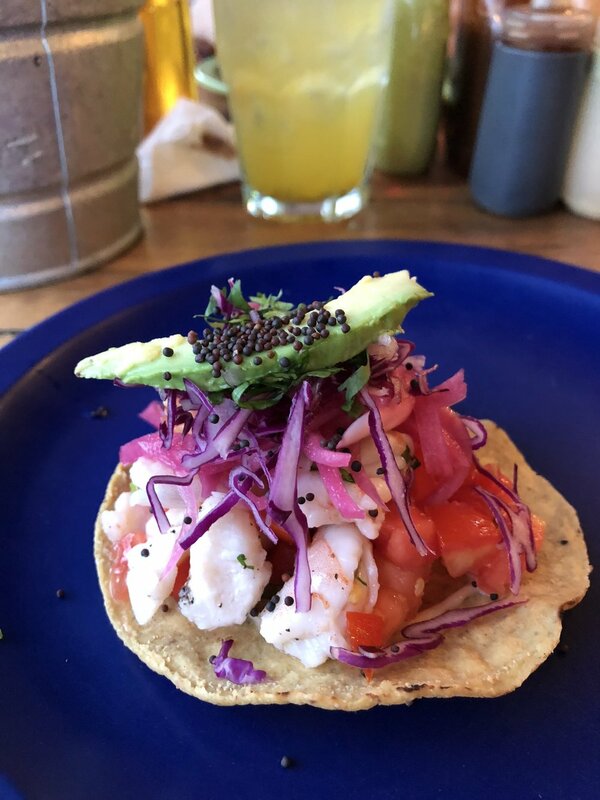 This outdoor restaurant focuses on seafood tacos, ceviche and tostadas. We loved this spot and came back twice! We especially liked the variety of sauces put on each table, it allowed you to spice up your tacos to accommodate your taste buds. 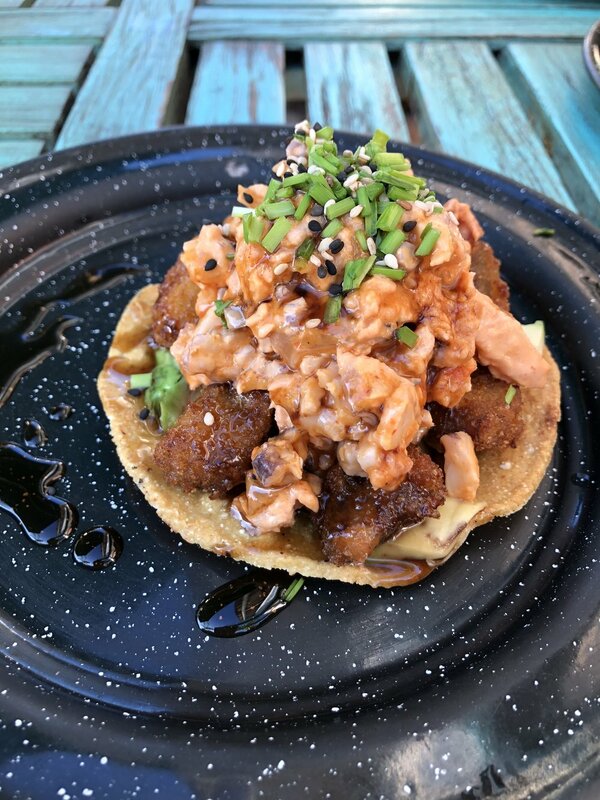 TIP: Try the tempura shrimp taco here. It was one of Ang's favorite from the entire trip. Follow the scent of freshly baked bread and you will undoubtedly find yourself at Chez Celine. This authentic french bakery on 5th street serves homemade pastries, breads, snadwiches, coffee, crepes and more. Come here for a long brunch or grab an espresso here in the evening and enjoy this little french bistro in Mexico. A literal hole in the wall, La Cochi-Loka is an awesome little find in Playa. 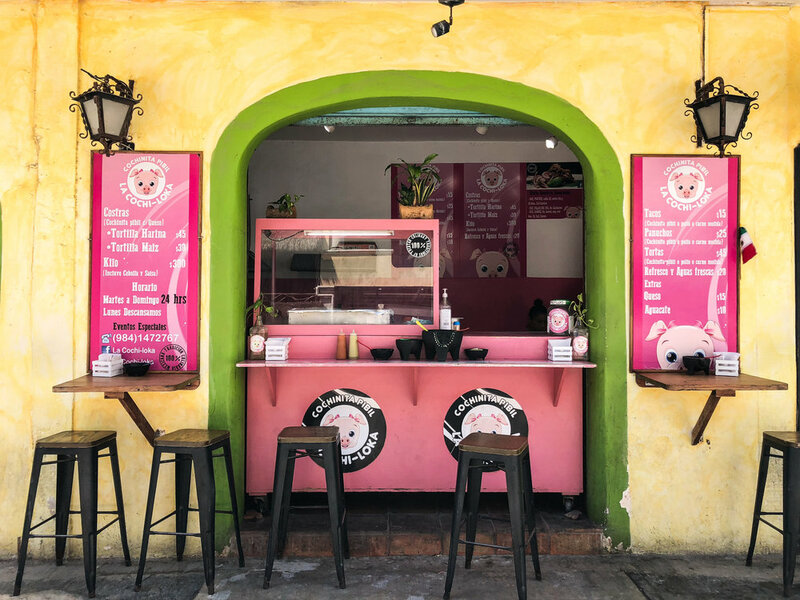 This walk up shop specializes in "cochinita pibil" which is a traditional Mexican slow-roasted pork from the Yucatán Peninsula. We had it on a torta with homemade bread, queso topped with purple onions and habanero sauce. For only few bucks this is the perfect spot to grab a quick bite. This restaurant is one of the most popular spots on 5th Ave and specializes in one thing. tostadas! 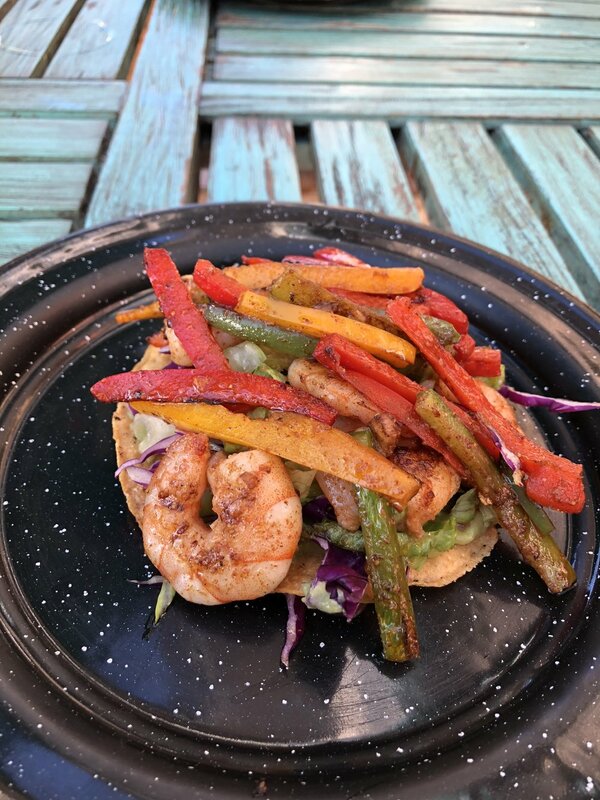 The menu has a variety of creative tostadas with seafood and delicious sauces. With a fun atmosphere, good drinks and sublime food this place is always packed. If you are a big fan of mezcal (like we are) La Perla Pixan is the place for you. 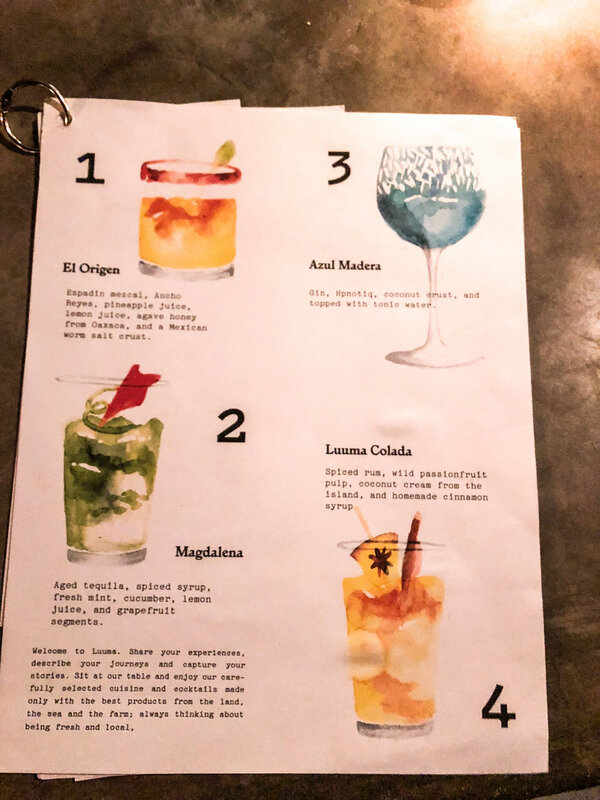 This bar exclusively makes cocktails containing mezcal. We came back to this bar a couple of times and had the chance to try a few of their unique cocktails and also some different types of mezcal. We loved how the mezcal shots came with lemons, cinnamon, and coffee to try with the smokey flavors of the mezcal. With a sophisticated craft cocktail menu and a beautifully designed bar, Trujillos blew us away. With giant trees literally shooting out through the roof; this place was stunning. The cocktails were complex, made with fresh ingredients and highlighted local spirits. The bartenders were great here and after some chatting they had us sampling some really unique ingredients and liquors native to the area. Inside the Mahekal Beach Resort, Calle 38, Gonzalo Guerrero, 77710 Playa del Carmen, Q.R. Coconut Kiwi cocktails and fresh Pina Coladas at Fuego! 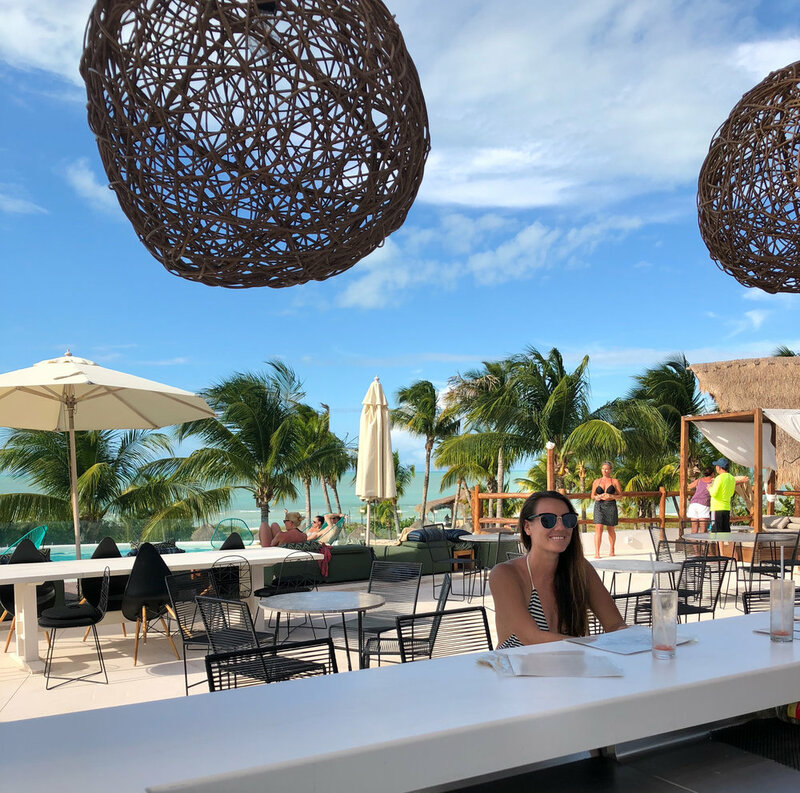 We stumbled across this beachfront bar in the Mahekal Beach Resort while walking down the beach. The tropical beach setting at Fuego is complete with hammocks, twinkly lights and sits directly on the main beach. 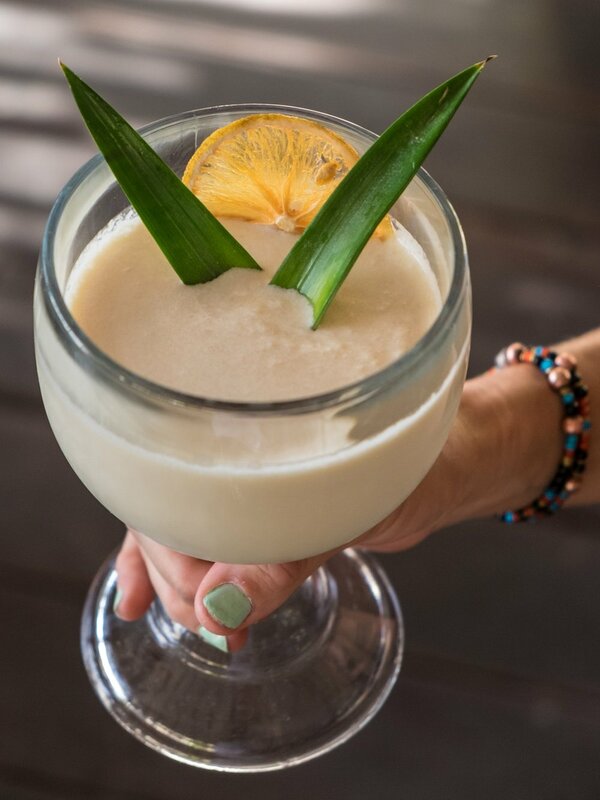 Stop in for a piña colada, they are just right here. 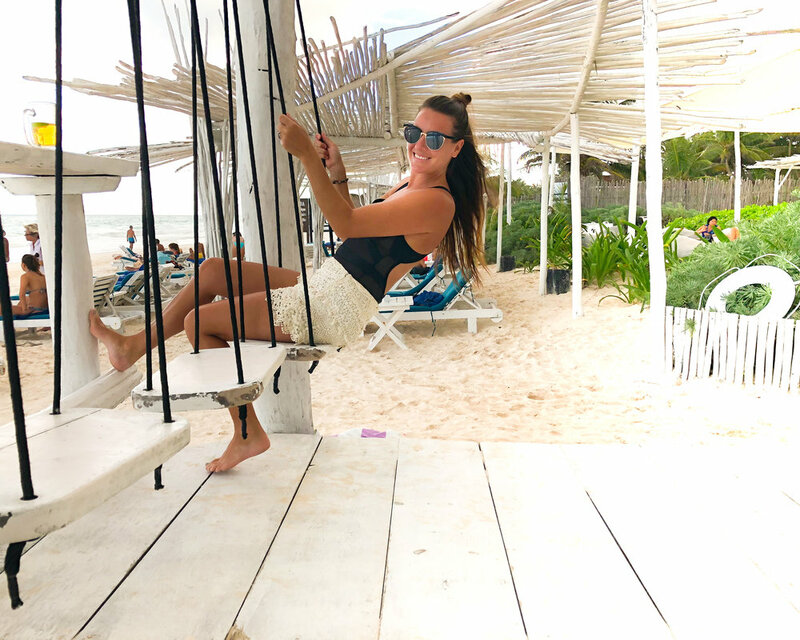 We hope you enjoyed this blog post on some of our favorite spots in Playa Del Carmen. If you are planning a trip to the Riviera Maya we hope you have a great time in this lively beach town. Sign up with your email to receive new updates from the road.